In addition to carefully planned menus, Michigan Dining offers one-on-one counseling with registered nutritionists and online tools to guide students in making good choices. Electronic wall menus in dining halls show the day’s selections with icons and logos noting nutrition and allergen information. We strive to serve everyone’s nutrition needs and make sure our dining halls are inclusive. Parents of students with allergies can have peace of mind that their student will have plenty of options in the dining halls. We go to regional farmers for meat, fresh produce, and all our dairy, so we know we’re getting the most nutritious ingredients. It’s also a priority for us to support our local economy. The U-M mobile app, can be downloaded through iTunes or Android. It provides breakfast, lunch, dinner and snack menus, nutrition and allergen information, and hours of operation for all dining facilities. 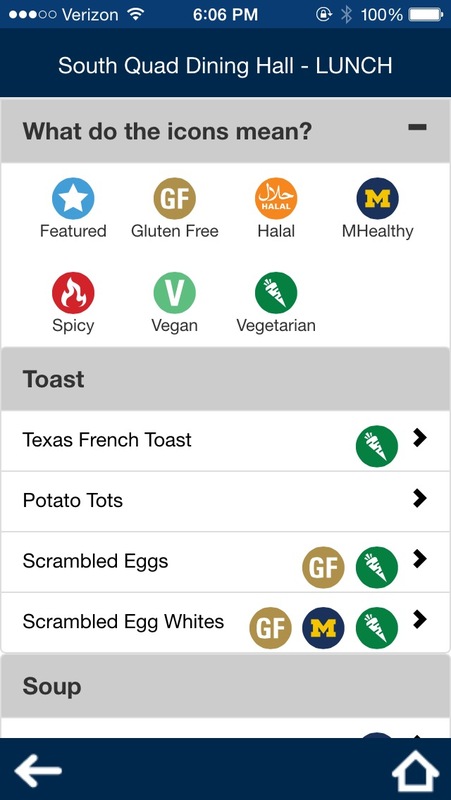 The MyNutrition tool allows students to preview menus, scan allergen alerts, and filter out what they can’t eat through advanced searches. The independent MyFitnessPal offers access to the entire UM recipe database along with the ability to track food intake and exercise goals. Just search for “Michigan Dining” when entering meals in the food diary. And the great news is that all of these services are available to your students whether they live on or off campus! Parents of off-campus students can go to Michigan Dining to purchase an optional meal plan or load up the student’s ID card with Blue Bucks, the campus currency used for on-campus dining, laundry and shopping.